Shepard (neck) was a full participant in Thursday's practice. Analysis: Shepard was held out of the Giants' last two games due to his neck injury but his full participation suggests he's now healthy. He'll likely return as the team's No. 3 receiver behind Odell Beckham and Sterling Shepard. Shepard (neck) was a limited participant in Wednesday's practice. Shepard (neck) is inactive for Monday's game against the Falcons. Analysis: Shepard's lack of availability is no surprise, given that he was limited in practice throughout the week after sitting out New York's loss to the Eagles in Week 6. In Shepard's absence, expect Bennie Fowler and Quadree Henderson to suit up in three receiver sets alongside Odell Beckham and Sterling Shepard. Shepard (neck) is officially listed as questionable for Monday's matchup with the Falcons, Ralph Vacchiano of SportsNet New York reports. Analysis: Shepard was limited at practice throughout the week after sitting out last Thursday's loss to the Eagles. 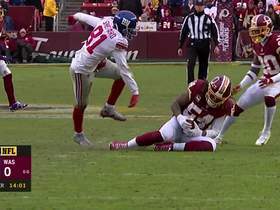 If he is unable to go the Giants will only have three healthy receivers in Odell Beckham, Sterling Shepard and Bennie Fowler, as Jawill Davis (concussion) has been ruled out. Shepard (neck) was a limited participant in Thursday's practice. Analysis: Shepard sat out Thursday's loss to the Eagles due to a neck injury, and still appears to be working towards recovery. If Shepard is unable to suit up for Monday's game in Atlanta, added opportunities would be available for the likes of Jawill Davis and Bennie Fowler. Shepard (neck) has been ruled out for Thursday's game against the Eagles. Analysis: Shepard was limited at Monday's practice and then held out entirely Tuesday and Wednesday. His absence shouldn't have much impact on the New York offense, considering Cody Latimer and Jawill Davis are both healthy. 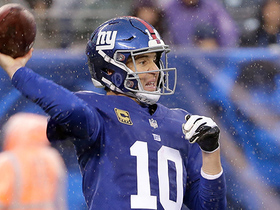 It's unclear which of the two will get the majority of the playing time alongside Odell Beckham and Sterling Shepard in three-receiver formations. Shepard (neck) was not seen participating in the portion of practice that was open to the media Tuesday, Dan Duggan of The Athletic reports. 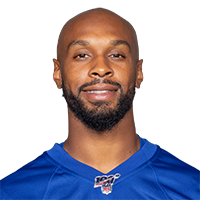 Analysis: Shepard, whose role in the Giants' offense has steadily grown over the last couple of weeks, was listed as a limited participant Monday, and it looks like his status will be downgraded to a non-participant Tuesday. 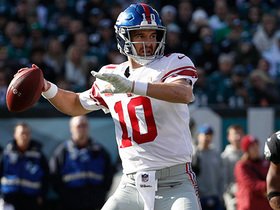 With the Giants facing a short week, Shepard could be in danger of missing Thursday's home game against the Eagles should his status fail to improve Wednesday. Shepard (neck) was listed as limited on Monday's injury report. Analysis: Shepard has taken on an increased workload the past two weeks -- 83 combined offensive snaps versus 10 the first three games -- but results have been modest, at best, in the box score. Overall, he has four catches (on eight targets) for 61 yards this season, so he may need an injury to a wide receiver in front of him on the depth chart to make a more consistent impact. 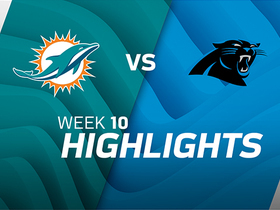 Shepard hauled in three of his four targets for 52 yards in Sunday's loss to the Panthers. Analysis: Shepard looks to be moving his way into the Giant's passing game more and more as the weeks go on, but he is still a clear No. 3 at best behind Odell Beckham and Sterling Shepard. Additionally, Cody Latimer -- who was active but did not log a snap Sunday -- is arguably ahead of him on the depth chart. Shepard consequently doesn't have much fantasy value, and he likely only will should either of the top two options suffer an injury. 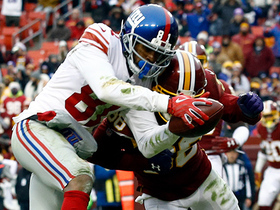 Shepard recorded one catch for nine yards on three targets in Sunday's loss to the Saints. Analysis: With wideout Cody Latimer (knee) out Sunday, Shepard stepped into the role of the No. 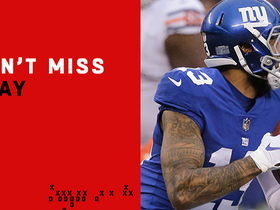 3 receiver for the Giants' offense. As expected, Shepard didn't get much work in a limited offense that relies heavily on its top options. Even if Latimer remains out, New York's offense isn't explosive enough for Shepard to be considered a legitimate fantasy option. Shepard is expected to replace Cody Latimer (knee) as the No. 3 wide receiver for Sunday's game against New Orleans, Art Stapleton of The Bergen Record reports. Analysis: The matchup may be enticing, but the No. 3 role doesn't mean much in this offense, even with tight end Evan Engram (knee) also ruled out. Latimer has five targets on 131 snaps, and Shepard has drawn one look on 10 snaps. 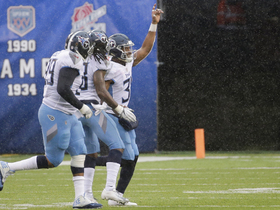 Shepard (finger) participated in Sunday's practice, Jordan Raanan of ESPN.com reports. Analysis: It's unclear whether Shepard participated in a full capacity just two days after dislocating his finger, but the fact that he was out on the practice field is a great sign for the wideout. Even if he was limited, moving forward, the injury likely isn't anything too serious for Shepard. Shepard is dealing with a dislocated finger, The Athletic's Dan Duggan reports. Analysis: The finger injury that forced Shepard to leave Friday's preseason win over the Lions has officially been diagnosed as a dislocation, which shouldn't keep him sidelined for long. He'll hope to be ready in time for next Friday's preseason contest against the Jets as he battles for a depth role at wide receiver behind Odell Beckham, Sterling Shepard and Cody Latimer. Shepard left Friday's preseason game against the Lions with a finger injury, Art Stapleton of The Bergen Record reports. Analysis: Before his injury, Shepard notched a 40-yard catch. The 27-year-old is fighting for roster positioning, but it likely won't be significant enough for fantasy relevance -- he's notched a combined 40 receptions and three touchdowns in the last two seasons. Shepard signed a contract with the Giants on Monday, Art Stapleton of The Bergen Record reports. Shepard will be released by the Panthers on Monday, Joseph Person of The Charlotte Observer reports. Shepard finished with 17 receptions (on 33 targets) for 202 yards and a touchdown in 15 games played this season. Shepard (shoulder) practiced fully Thursday, Jourdan Rodrigue of The Charlotte Observer reports. Analysis: After taking off roughly two weeks due to a shoulder injury, Shepard returned to practice in a limited capacity Wednesday and felt good enough one day later to complete an entire session unscathed. He joined No. 1 wideout Devin Funchess (shoulder) as full participants, which leaves the Panthers' receiving corps in a rare injury-free reality heading into Week 17. Shepard (shoulder) practiced on a limited basis Wednesday, Bryan Strickland of the Panthers' official site reports. Analysis: Returning to practice for the first time since Week 15, Shepard backed up head coach Ron Rivera's assertion Tuesday that the wideout would be available for the regular-season finale, according to Jourdan Rodrigue of The Charlotte Observer. Shepard would lend more credence to the expectation with a full session by the end of the week, at which point the Panthers will firmly pin down his potential to play Sunday in Atlanta. Panthers head coach Ron Rivera said that Shepard (shoulder) would play in the regular-season finale Dec. 31 against the Falcons, Jourdan Rodrigue of The Charlotte Observer reports. Shepard (shoulder) is inactive for Sunday's game against the Buccaneers. 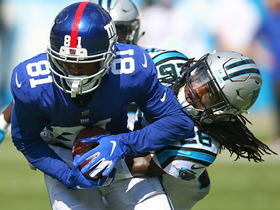 Shepard (shoulder) is listed as questionable for Sunday's game against the Buccaneers, but Panthers head coach Ron Rivera expects the wide receiver to play, David Newton of ESPN.com reports. Analysis: Per Joseph Person of The Charlotte Observer, Rivera did admit that he's most worried about Shepard among the team's five players listed as questionable. It sounds as if the slot receiver should still be able to play, but there isn't any reason to expect more than two or three targets, even in a prime matchup against the Tampa Bay secondary. Shepard was held without a target the past two weeks, logging 45 snaps on offense in that stretch. Shepard (shoulder) remained sidelined for Thursday's practice, Jourdan Rodrigue of The Charlotte Observer reports. Shepard (shoulder) was unable to practice Wednesday, Jourdan Rodrigue of The Charlotte Observer reports. Analysis: Shepard's Week 15 was cut short due to a shoulder injury, but his season has taken a turn for the worse since Kelvin Benjamin was traded to Buffalo at the trade deadline, In six contests since the deal, Shepard has been blanked in the box score four times, despite averaging 31.7 snaps on offense per game. Fortunately for Shepard, he's expected to return to practice Thursday, according to Bryan Strickland of the Panthers' official site, which bodes well for active status this weekend. Shepard is questionable to return to Sunday's game against the Packers due to a shoulder injury, Joe Person of The Charlotte Observer reports. Analysis: Outside from an illegal block in the back and inducing a pass interference, both in the third quarter, Shepard was kept silent in the box score. No matter, his production has been sporadic this season, so the Panthers are unlikely to experience any speed bumps if he's unable to reenter the contest. Shepard (shoulder) practiced in full Thursday, Jourdan Rodrigue of The Charlotte Observer reports. 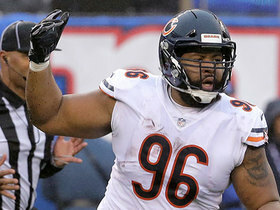 Analysis: Shepard followed up Wednesday's capped session with an uninhibited one, paving the way for active status Sunday against the Packers. The opponent is quite yielding to wideouts -- 167 receiving yards per game and 15 touchdowns allowed in 13 games -- but the passing game has been the domain of Devin Funchess and Christian McCaffrey since Kelvin Benjamin's last game as a Panther in Week 8. Shepard (shoulder) practiced in a limited fashion Wednesday, Jourdan Rodrigue of The Charlotte Observer reports. Analysis: Shepard has been a beacon of health for the Panthers this season, but the departure of Kelvin Benjamin hasn't yielded much in terms of production. In five games with the altered reality, Shepard has been blanked three times while combining for six receptions (on 12 targets) for 69 yards in the other two contests. If he sheds the issue by the end of the week, he'll attempt to exploit the Packers' 24th-ranked pass defense Sunday. Shepard caught three of five targets for 29 yards in Sunday's 31-21 loss to the Saints. Analysis: Shepard finished third on the Panthers in targets and produced his second best yardage total since Week 1. His role as the team's No. 2 receiver simply isn't equating with regular production, as evidenced by zero-catch outings in two of his past four games. A Week 14 matchup with Minnesota is unlikely to make things any better. Shepard nabbed three of seven targets for 40 yards in Monday's 45-21 win over Miami. Analysis: Carolina's receiving corps is looking mighty different than it did a few weeks ago. Now, not only has Kelvin Benjamin been shipped to Buffalo, but rookie speedster Curtis Samuel faces extended time on the shelf. If Monday is any indication, Shepard might be in line to pick up some of the slack. Monday marked season highs in both catches and targets for Shepard, who flashed some big-play ability in Tampa Bay last season -- five of his 23 catches went for 20 or more yards. Shepard failed to catch either of his two targets in Sunday's 20-17 win over the Falcons, but he did rush once for 11 yards. 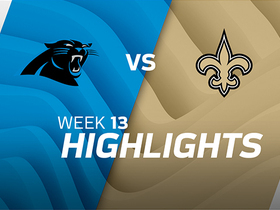 Analysis: Shepard's lack of production was emblematic of the Panthers as a whole, as their mere 137 yards through the air came while only three players caught passes. One of those players was Curtis Samuel, who is in competition with Shepard for more looks following Kelvin Benjamin's departure. Considering Shepard has only been good for a catch or two per week, the rookie Samuel doesn't have to do much to keep him at bay, but Shepard will still aim to get more involved next Monday versus the Dolphins. Shepard could take on a larger role after Kelvin Benjamin was traded to the Bills on Tuesday, John Wawrow of The Associated Press reports. Analysis: Shepard has primarily operated out of the slot, catching 11 of 19 targets for 133 yards and a touchdown in eight games. The trade could free up snaps for him outside, which would in turn allow Curtis Samuel to get more work from the slot. Shepard gets a small boost, but he hasn't shown much ability to turn playing time (284 offensive snaps) into actual production.